The ceasefire in Sri Lanka in 2002 opened up areas of the country that had previously been cut off during the civil war and for the first time in many years, travel into schools in these areas became a real possibility. In its first year of operation, VESL was able to establish links with a number of schools in rural areas of the North, East and Central Provinces, enabling projects to run within Sinhalese, Tamil and Muslim communities. In the Spring of 2003 VESL sent a small team of volunteers to establish projects in primary and secondary schools across five rural areas within Sri Lanka. The volunteers were greeted with huge enthusiasm from the schools and surrounding communities and were able to run projects both inside and outside the school timetable. In some schools volunteers also ran classes for teachers. Within every region our team visited, the shortage of teachers and resources was countered by the passion and energy of every student. The programme offered the participants a unique opportunity to gain an understanding of life within these communities and of the everyday issues associated with living in rural areas recovering from conflict. Living in family households, the volunteers were fully immersed in Sri Lankan culture. After the success of that inaugural year, VESL received numerous requests to return from the Sri Lankan education department, and from the schools themselves. In January 2004, VESL gained registered charity status within the UK and set about developing an rolling programme of projects. A mark of everyone’s efforts came in 2005 when the Sri Lankan government signed an M.O.U. [Memoradum of Understanding] and gave VESL official N.G.O. status within the country. In addition to our activities within schools we were able to run a number of teacher training workshops for local Sri Lankan teachers. These initial workshops received great praise from everyone involved and the Sri Lankan government requested that we continue to develop this project. In 2006 and 2007 a dedicated team of teachers from the UK were able to run workshops for more than 1400 Sri Lankan teachers and feedback showed the project to be a resounding success. In 2007, VESL was very pround to send its first volunteers to Andhra Pradesh in Southern India to work on a range of educational projects with a number of local NGOs working in community development. Whilst remaining focused on education we were able to build links with a number of orphanages and hospice projects and have been able to support English teaching within many varied non-traditional schooling environments throughout our time in AP. In that year we were also able to start sending our first set of long term volunteers on 3 and 6 month placements. VESL also began to empoly its first local in-country managers to support volunteers and help establish links into new regions. The success of our Sri Lankan and Indian programme allowed us to continue to expand our programme and 2008 saw the start of a programme in Northern Thailand’s Chiang Rai Province. We were careful to gain the support of the education authorities in both Bangkok and Chiang Rai and, with their guidance, were able to identify a great set of schools to develop the programme with. 2009 was a busy year for VESL. We gained an official M.O.U. from the Thai government and the programme has gone from strength to strength. We were also able establish a relationship with a number of UK universities and began running joint volunteer programmes for students from Manchester Metropolitan University and Keele University. This later expanded to include Edge Hill, Northampton, Aston and CASS. In 2009 we were also invited by the Thai education authorities to run a set of Teacher Workshops allowing UK teachers and Thai teachers to exchange ideas. This was a great success and was repeated in 2010 and 2011. In 2010, through our ties with Northampton University, we were able to develop a new programme in Kerala in the very South of India working in schools within local fishing communities. The pilot projects were extremely well received and we have been able to build on this since then, and we are currently working in five schools in Kerala through out partner NGO. 2012 saw a radical change in VESL’s structure, when we employed our first full time member of staff, Lauren Pluss (a past volunteer), as a new Programme Manager. 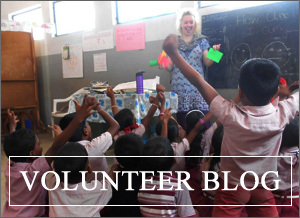 Lauren originally volunteered in India for 3 months in 2011, and became our Overseas Programme Assistant in 2012. It was an exciting time for VESL. 2013 saw the largest number of volunteers going overseas that VESL had ever sent in a single year and this included a number of 12 month placements. Unfortunately our excitement was not to be sustained as our three-year development plan was not able to see the course. To get our small charity into the full-time employer leagues we had been forced to ask an enormous amount of both Lauren and Ian, far beyond the salaries we could afford to pay! When opportunities elsewhere become available to Lauren in early 2014 she, very understandably (and sensibly), moved on. VESL found itself without the resources, in terms of finances or staff, to commit itself to hiring more staff or embarking on another round of UK wide recruitment and training and the difficult decision was made to make 2014 our last year of sending volunteers overseas. Although not anticipated or a decision made without sadness, it was absolutely the right decision to have made. For more than a decade we had managed to run our successful little overseas programme, however, time marches on and many of those who were instrumental in the success of VESL throughout the years now had small families, jobs and/or businesses of their own and the burden could not continue to be placed on an ever smaller number of key individuals. The time had come to wind things down for all concerned. Is that the end for VESL? We hope not. We have no further plans to recruit volunteers beyond 2014 but we are exploring the possibility of finding a new funding model and re-establishing VESL as an educational grant-giving body that might help to support educational projects overseas indirectly. We are currently conducting a scoping exercise in order to fully flesh out the practicalities of this move but we are hopeful that we’ll be able to achieve our goal and expect to have more information for interested parties in the Spring of 2015… so watch this space. VESL was originally registered with the UK Charity Commission in 2004 as ‘Volunteers for English in Sri Lanka’ (reg. in England and Wales – charity no. 1101749). Due to our expanding charitable aim and our desire to run projects outside of Sri Lanka, VESL changed the organisation’s structure and name in 2008 to ‘Volunteer for Educational Support and Learning’. VESL continues to be run by the same team and our desire to continue to work in Sri Lanka did not changed.